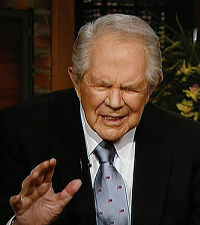 Oh Pat Robertson, when will you learn? Pat Robertson has been found yet again saying something that has made the masses wonder why on Earth this guy still has a following. On a recent show, Pat Robertson gave advice to a viewer “who has a friend” that is cheating on his wife who has Alzheimer’s. Pat’s advice: Divorce her and start all over again, just make sure she has custodial care. I feel that anytime Mr. Robertson opens his mouth, my IQ lowers a bit. But that didn’t happen this time. His words, while I strongly disagree with, gave me some good observations about marriage and where our ethics lie. Let me first start off by saying that I hotly disagree with Pat’s advice. I believe that his advice is wrong on so many levels. I take the vow of “…in sickness and health, until death do you part” very literally and very seriously. Pat talks about this on his show as well and defends him claim by saying that Alzheimer’s is a form of death. Well that may make some logical sense, this interpretation of “death” opens up way too many slippery slopes. What makes Pat Robertson qualified to make this claim? How do we know everything that goes on in the mind of someone with Alzheimer’s? If we allow for this to be death, what other things can we justify? Where do we draw the line? Second, Pat’s advice is completely self-centered and shockingly against Biblical principles of marriage that talk about self-sacrifice and two becoming one flesh. Marriage isn’t about what you can get out of it, it’s about what you can give to the person you’ve chosen to love more than anything else in this world. The moment you start making guidelines and loopholes for getting out of a marriage, you’ve completely missed its point. And third, if you’re the type that believes in a soul, how can we just easily divorce someone on the basis of them being “dead” if the soul is still there? If my wife had Alzheimer’s, the functioning part of some of her body might be dead, but there is still so much that is alive, including the divine spark within her. When I first heard this story, I found myself discussing it with people whom I greatly respect that disagreed with me. One mentioned a story about how a man did divorce his wife and married another but they both – husband and new wife – live with her and take care of her together. Another mentioned that it’s hard to give a point of view on this when we haven’t been in that situation. Perhaps we might be more willing to understand if we could feel the man’s aching desire for companionship. And these are really good points. And then I realized that I was looking at this from a different ethical structure than my friends. Where I am more principle minded and feel that you should do the right thing every time, no questions asked, my friends were approaching it from a more consequential view that said if it’s not hurting the wife, then why shouldn’t the man be happy? Both points of view make for a good argument and maybe there’s no fully correct point of view – just different approaches to the same metaphorical chess game. But I still think I’m right. I answered yes. I had to. I love Sarah more than I love myself. After I thought all this, Sarah came into the living room where I was sitting. “WHEN you go crazy,” she chuckled. I believe the conversation we had is a small glimpse of what true marriage sounds like. Marriage is a contest to see who can practice self-denial better. Marriage should be full of arguments like “You take the last piece of pie – no YOU take it!” and “I love you more and I’ll show it – no I love YOU more and I’ll prove it!” Marriage means you should be willing to let the other one go but would never – NEVER even consider it if the tables were turned. Marriage is indeed one flesh and there’s just no separating it. Paul talks about the sacrifice of marriage in Ephesians 5. He calls it a mystery, meaning that we wouldn’t have figured out how to do marriage this way on our own, it was advice given from God. And he’s right. In our self-centered world, a self-sacrificial marriage sounds crazy. But when both husband and wife do this, marriage becomes the most joyful, wonderful, passionate thing in the world. Until death do us part…and maybe even a little longer than that. I’m going to try and make a deal with God to see if I can have Sarah again on the other side of eternity.